No one likes to imagine his/her smartphone should be stolen or lost because we all use to store our huge amount of data in mobile phones whether its our personal data like photos, videos and contacts or confidential information like bank details, business details etc. We hardly see anybody without cell phones these days. from a child to an old age person smartphone is must. If some day we come to know that our cell phone gets lost or stolen then we feel very helpless. Mobile phone companies are aware about this fact very well that these day how important cell phone is for everyone. So that’s why we all are getting feature of find lost cell phone/ device in our mobile phones. With this feature we can track our lost or missing mobile phones. Its a in built feature in mobile phones but still we have to perform some manual steps to get information, if any how you miss your phone ever. 1. Go to settings option on iPhone. 2. In settings tap on iCloud option. 3. In list at bottom select Find my iPhone option. 4. select next and tap on the position to get it on. 5. select send last location and turn the option on. Once find my iPhone feature will be enables, you will be able to track your stolen/lost with the help of find my iPhone feature on other iOS devices or you can also visit iCloud.com and login to your account of iCloud. At the time of tracking your iPhone from find my iPhone or from iCloud.com, you can lock your device with a pass code or password. You can get this information like at which place now you iPhone is and at which place earlier it was means last location of your iPhone. You will be allowed to remove all data of the devices. 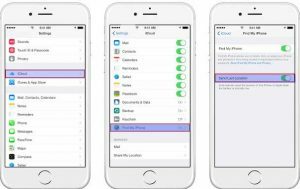 Make sure your iPhone is turned on and should be connected via internet whether by mobile connection internet or by Wi-Fi. So that service can work.But in case your iPhone is stolen by someone and that person who stole it turn internet service off on your device immediately then you cannot not do anything untill internet service is turn on. 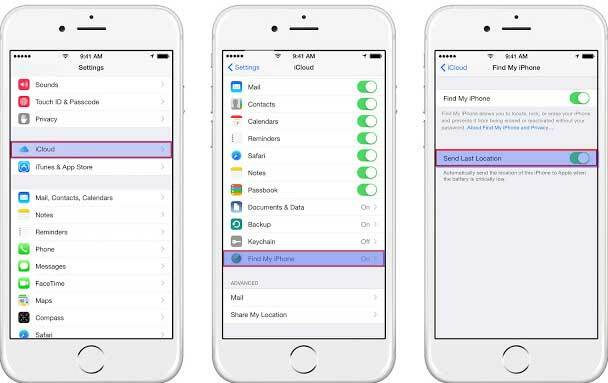 If you turn on “Send last location” option on iPhone then you will get information about the lost location of your iPhone once battery goes low but if in case battery if your phone is dead then you will be totally helpless. Still it will provide you the details of starting point to go and start track your iPhone. If you or anyone else wants to deactivate find and iPhone Feature then it will be required to provide apple id and password until and unless you or any one else won’t provide these details, service will not disabled from iPhone.